And the remakes keep on coming . . . BUT if they can keep up this standard then be my guest (I couldn’t resist). 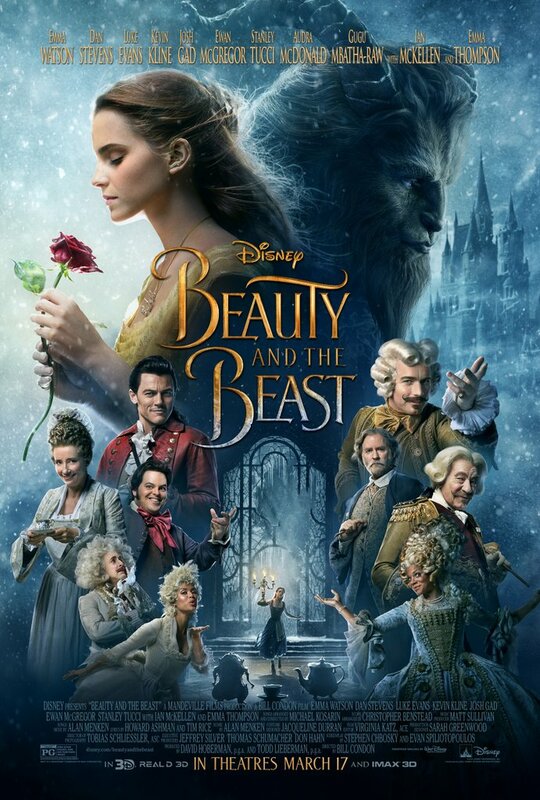 An adaptation of the fairy tale about a monstrous-looking prince (Dan Stevens) and a young woman (Emma Watson) who fall in love. After complaining for the last five years about reboots and remakes, I was livid that even Disney were revisiting their backlog. I mean is that hard to find original stories? If you are going to remake movies, can you at least tackle the bad ones? Leave the classics alone! However, I was pleasantly surprised with Kenneth Branagh’s rendition of Cinderella. The less we say about the Alice in Wonderland movies, the better. While The Jungle Book fell short of the classic by a country mile. So my feelings about watching the new Beauty and the Beast were mixed, to say the least. Especially when I discovered that there was an extra 45 minutes on the running length to the 1991 animated hit! BUT after all my griping, I finally gave it a go and you know what? It wasn’t too bad at all. The opening surprised me from the get go. Expanding on the origin story of the curse. The overture fell a little flat but the lavish set designs, costumes and Tobias A. Schliessler’s beautiful cinematography took my attention away from that bum note. The Belle sequence was literally a shot for shot live action re-enactment. Emma Watson was the physical embodiment of Belle. Her singing wasn’t the strongest but a lovely voice all the same. Luke Evans and Josh Gad were fantastic. Evans played Gaston with aplomb. He was Gaston, nailing the shallow womanizer perfectly. Who better than Olaf from Frozen to take on Gaston’s long suffering, and incredibly flamboyant, partner in crime LeFou. Gad was equally as entertaining. Prancing and pouting about the place. The controversy about the gay subtext was misplaced. If there was one, I didn’t notice and it didn’t ruin the story in any capacity. Belle was always a strong feminist character that wanted more from the world and her role. Her confrontation with a villager over teaching a young girl to read was a little heavy handed. I was disappointed with Kevin Kline’s performance as Maurice. He was far too deadpan for the role. Belle’s father was always the quirky crackpot. A shame considering you had the best man for the job. I mean, he was in A Fish Called Wanda?! He didn’t even have Rex Everhart’s delivery. Too stern and frail. The pace kept things moving along and the film was easy-going and highly watchable. From the trailers and teasers, I thought the effects on the Beast looked dreadful BUT once Belle entered that haunting Gothic castle, I was impressed. The special effects and CGI were brilliant. The Beast actually looked quite good. Stevens did well and I could understand his gravelly voice. Not quite Lance Henriksen’s gravitas BUT he still delivered a sterling performance. I think what helped (and had to) was that the pair had great chemistry. The extra running time fleshed out the pair’s blossoming romance and made it a little more believable that this stubborn and unloving beast would take some time to get over his hurt ego and learn to love again. The supporting cast had tough acts to follow BUT what a cast?! Ewan McGregor and Sir Ian McKellen played Lumiere and Cogsworth perfectly. They were a great duo and kept things entertaining. Even if I couldn’t help but laugh at McGregor’s ‘Allo Allo accent. The Moulin Rouge maestro excelled with his rendition of Be Our Guest. Stanley Tucci was wasted in his small role as Maestro Cadenza. While Emma Thompson was so-so for me as Mrs. Potts. Her mockney accent grated against me in parts. She was always going to have a tough act following in Angela Lansbury’s footsteps. BUT as soon as Beauty and the Beast came on, and Belle strolled down those labyrinthine stairs for that infamous dance, it still worked a treat and Thompson excelled. Composer Alan Menken thankfully kept the original soundtrack and added new entries. The only problem was that they weren’t really that memorable. Days in the Sun wasn’t a bad song BUT the others have . . . already slipped my mind. The story was still the same BUT the extra fleshing out wasn’t a bad approach. Especially when they played on the magic of the Rose and the flashback to Belle’s childhood. It was different. Just a shame that it led to the same old result BUT why stray away from a winning formula? Thankfully, there was enough heart, charm and cheese to make this an entertaining affair that complimented the original Disney classic and just about stood on its own two feet.